People aren’t just fans of Marvel; they often live and breathe for the fandom. The fandom is bae, some would say. Go to any midnight showing or Comic Con and you’ll see fans who have built their entire identities around their favorite series or character. It’s a marketer’s dream. The same could be said for Skittles – a brand with some fierce loyalists. Skittles were the only candy allowed in my 7th grade class per the direction of our teacher, a self-confessed Skittles head. 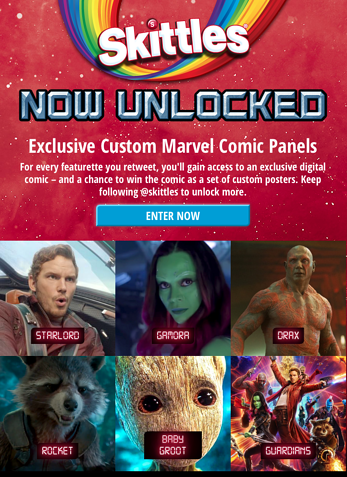 To get fans excited for the premiere of the Marvel’s latest blockbuster, Guardians of the Galaxy 2 Vol.2, Skittles launched a sweepstakes tailored to the type of rewards Marvel fans would get excited about – the chance to gain access to an exclusive digital comic and win custom posters. In order to win, fans were encouraged to share/retweet a video Skittles was promoting and opt into a sign up form on the campaign microsite, which included a Countdown Calendar unveiling a new character and comic to encourage fans to keep checking back. Skittles and Marvel made some great choices that you can incorporate into your next out of this world campaign. Offer a relevant prize. Many loyalty programs offer their customers the same types of rewards: discounts, free shipping, and free products (to name a few). While appealing, catering your rewards menu to your fans will increase enthusiasm and participation by tapping into your consumers’ interests, which is exactly what Skittles and Marvel did by offering exclusive comics and Marvel posters. Partner up. Skittles did a great job at integrating Marvel and Guardians of the Galaxy into their campaign and promotional strategy, tapping into Marvel’s fandom. Any brand can benefit from teaming up with a complimentary brand to expose your brand to a new fan base and increase overall brand awareness. Keep your fans coming back. Campaigns traditionally see a surge of activity immediately after launching, but that initial enthusiasm gradually dissipates without ongoing promotion. By spreading out rewards, like Skittles and Marvel did by using a Countdown Calendar, brands can encourage repeat visits and generate ongoing momentum for their campaign. Although the Skittles campaign has ended, you can still check out their campaign here and catch Marvel Studios' Guardians of the Galaxy Vol.2, in a theater near you!